For most consumers, if they’re even aware of near field communication (NFC), it still seems like a far-off technology, not really something they’ll use on a regular basis. But Samsung is trying to champion the short-distance wireless technology and is introducing new programmable NFC tags that work with a new mobile application on NFC-enabled Android (s goog)devices. Samsung is rolling out Samsung TecTiles, which can be programmed to do about 25 tasks, from changing phone settings or making a call or text to joining a Wi-Fi network, opening an app or web page or posting an update or tweet. Users who tap the back of their phone against a TecTile tag could also do an check-in at a location or they could open a map, swap business contact information or “like” something. The tags, which will be sold by all four major U.S. carriers in packs of five for $14.99, will work with a free TecTile app, downloadable through Google Play. The app will allow users to program the NFC tags, which can be reprogrammed as many times as needed. Now, there are programmable NFC tags on the market and apps such as NFC Task Launcher on the market. But few people are actually doing anything serious with programming NFC stickers, in part because there aren’t that many NFC-enabled phone available. But Samsung believes that with its latest crop of Samsung Galaxy S III phones, along with a handful of earlier NFC-equipped devices, it will have the biggest number of NFC-enabled devices in consumers’ hands, putting it in a place to help drive adoption of the technology. I’m excited about this because it gives consumers a way to get educated about NFC. Often times, we talk about NFC in terms of payments, but TecTiles really show how NFC can work in a variety of non-payment settings. And the fact that users can actually program the tags themselves lets them get personal and creative with the technology. DeCarlo showed off some examples in a briefing including the ability to tap your phone while leaving your office to send a spouse a message alerting them you’re on your way. Others uses include tapping a phone to set an alarm or silence a phone heading into a meeting. All you need to do is set the task and program the sticker and it’s good to go, though you will want to label the sticker if you’re making the tag public. I previously wrote about the ability for small businesses to use NFC tags to help enable social actions. SocialPassport, a New York company, has introduced NFC tags that can let people check-in, “like” a business or tweet out a message, sometimes in exchange for a discount or coupon. I think businesses could get a lot out of these tags, at the very least making it easy for people to check-in. That would give them some valuable data on who their customers and provides another channel to engage them with offers. TecTiles will only work with Android devices, but it doesn’t have to be Samsung only. Other NFC-enabled Android devices will be able to use TecTiles. And DeCarlo said that Samsung is also looking at giving developers an API to add more tasks to the tags. 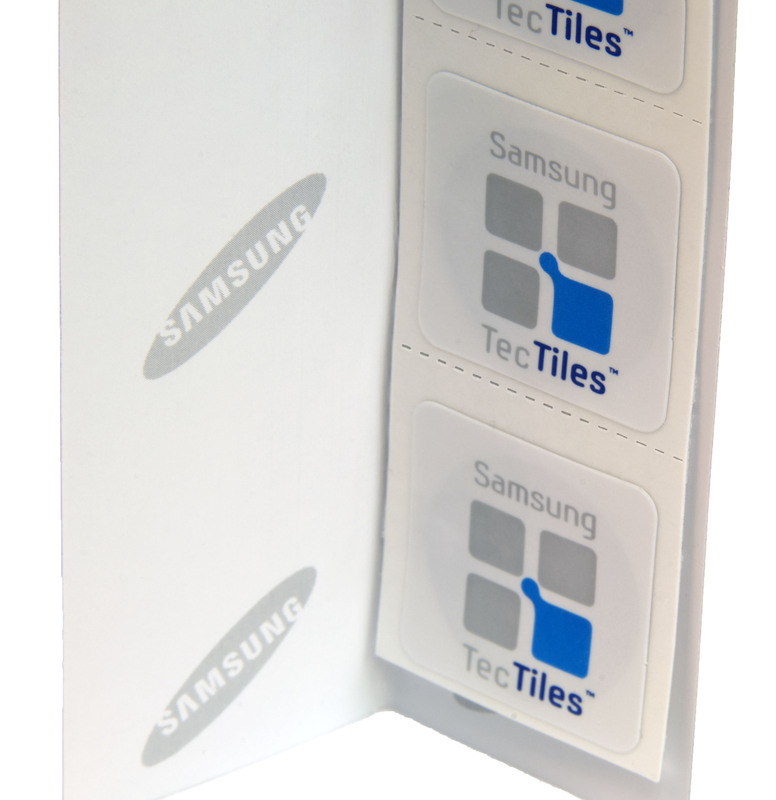 “TecTiles will only work with Android devices” Tectiles use mifare classic chips. In Theory, they also work with Nokia handsets, read/write with another app. Someone feedback? BlackBerry’s and the nokia lumia 610 can’t read/write tectile/classic tags because they don’t have an nfc controller chip from NXP. Looking at the price, no reason to buy tectiles, nonames can do the same job. NFC tags , a huge page with a lot of info about tectiles, mifare, smartTags and much more. 2. on my desk, it connects to the wifi automatically. 3. on my night stand, it sets all my alarms automatically to wake up in the morning. 4. i have one on my blue tooth head phones, turn it on/bump them together: the phone activates the bluetooth then connects. 5. in the car, put it in the dock, automaticly goes to driving mode. Its nice they are giving the app for free, but the paid apps like NFC Task Launcher support more things to automate. As far as the price of the tags, way too expensive. For the same amount, companies like tagsfordroid give you twice as many, and with better specs (more memory for example). @seyonHomes , you should change….so many more features. Could you list 3 or 4 things you’d do with this technology? functionality and there are several reasons i can share with you for how importance NFC is.More about What are Samsungâ€™s NFC TecTiles for the Samsung Galaxy and what do they do?